Despite being the top-selling Nissan vehicle for both 2017 and 2018, there are many people who still don’t know about the phenomenal Nissan Rogue. This is a vehicle that is geared to set an all-time sales record going into the 2019 model year. Nissan made several upgrades and changes to the 2018 model; for 2019, they’re continuing this trend. Expect extensive updates and upgrades that will push the Rogue to the top of the must-drive list. While the Rogue has always had a sleek design, the latest models all feature a more progressive look with Nissan’s signature V-Motion grill, LED daytime running lights, auto-off halogen headlights, LED boomerang signature taillights and body-color, heated outside mirrors. You’ll also notice the redesigned rear spoiler, privacy glass, panoramic moon roof and roof rails – and so will everyone else. The Rogue is ready to handle curves, cut wind drag and increase fuel efficiency for drivers, all thanks to a lower and wider stance. It also looks really good, which doesn’t hurt. But the design features Nissan included are so much more than cosmetic. Each aerodynamic feature helps the vehicle perform better and more efficiently, meaning less fill-ups and fewer maintenance trips over time. Cosmetically, the Rogue line comes in one of nine exterior colors, letting you flex a bit of personal style. When you think SUV or Crossover, your first thought is most definitely not luxury. The Rogue will make you think differently. The D-shaped steering wheel, leather booted shifter and luxe six-position Zero Gravity driver’s seat with lumbar support and heat makes the drivers cockpit feel lush and indulgent. 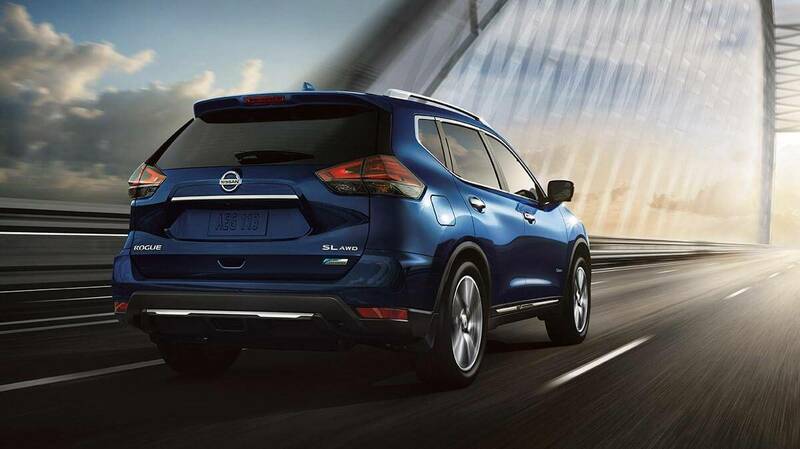 Each seat in the Rogue, with the exception of the driver’s seat, folds down. The cargo area can be enlarged using the Divide-N-Hide cargo system in 18 possible variations that make it easier to make your vehicle work for you. The Rogue even has enough space for an 8-foot ladder! Pick and choose what you want most and accessorize to make your Nissan Rogue truly yours. News reports are filled with stories of parents tragically losing babies and small children after they are accidentally left in vehicles. Nissan took action with the Rogue to give parents the tools they need to protect their little ones. The RDA, or Rear Door Alert system, alerts drivers with a very distinctive horn sound when there is even the slightest chance drivers have left a precious package in the backseat. RDA also detects when a rear door is opened and closed before a trip, yet isn’t re-opened when the vehicle is in park; this ensures that busy and frazzled parents never make that costly mistake. The Rogue also has a few other unique safety options from the Nissan brand: lane departure warning, intelligent lane intervention, automatic emergency braking, pedestrian detection and blind spot warning to prevent accidents. Driver Assist safety features are a huge selling point for modern vehicles – the Rogue comes well equipped! Only two Nissan vehicles offer the ProPILOT Assist system; the Rogue is one of them, which is great news for drivers who love it. This is a system that is similar to cruise control, yet offers many more benefits. Under certain driving conditions, the ProPILOT system reduces the amount of driver acceleration, steering, and braking input. When the steering wheel ON button is pressed, and the intelligent cruise control is set to the desired speed, steering assist engages and takes over a lot of the minutiae of driving to help reduce driver fatigue. An additional front camera and sensors linked to ProPILOT assist extends functionality. Plus, the entire system is intuitive and user-friendly. Self-driving vehicles are not as futuristic as we might think. The ProPILOT system is a huge step toward automation, but it’s safer than full automation by a long shot. The Rogue is built for power, with a highly responsive engine laden with just enough horsepower to get the performance you desire, yet preserve mileage. Decent torque and an advanced Xtronic transmission add to the performance to create a vehicle that lets you cut around corners and curves with ease. It’s also remarkably smooth thanks to a standard four-wheel independent suspension, four-wheel disc brakes and anti-lock brake system with traction control. Whether you are heading to the mountains to go camping with the family or just off to work in the city, the Rogue is a powerful and beautiful choice. Slide inside the driver’s seat and you’ll see exactly why driving it is effortless and fun. The Rogue line boasts a number of different models, with additional options offered in coming years. As of 2019, the baseline packages include the S, SV, and SL. Each is available in front or all-wheel drive; there is even a hybrid version available in certain markets. Along with an impressive list of standard features embedded in each package, Nissan also included several optional customizations. These include motion-activated Liftgate, leather seats, additional speakers, heated outside mirrors, push-button ignition, leather-wrapped steering wheels and so much more! Tempted to take one for a test drive? Visit your local El Paso Nissan dealer today to configure your new 2019 Rogue with all the options that will make your life easier and safer!